As we continue with our Coral theme for the latter half of March (how is this the last Monday of March already???) for #CBBxManiMonday, I feel a little bit like the weather - I'm sort of straddling the brightness of spring and the deep, dark of winter. As I sat and tried to decide on a colour combination to pair the coral, I was initially drawn to bold blues and soft dove greys, but in the end I decided I had to go with plum and I feel like it's a sort of underused pairing. Honestly, I didn't entirely have a plan going into this, but I think it turned out pretty well. I started with a coat of Unt Ready For Take Off Base Coat (as I did, admittedly, with the two mani's I tried to put together before this one that did not work out) and then followed with two coats of O.P.I. Rich & Brazilian, which is a deep shimmery plum shade with really warm toned shimmer through it. Next, I wanted to add a little bit more oomph to the finish of the base, so I went in with a thin coat of F.U.N. Lacquer's Empire, which is a sort of raspberry shade that is just jam packed full of holo goodness. For the stamping, I wanted something that was going to feel graphic and not too delicate, so I grabbed my Maniology (formerly Bundle Monster) + elleandish BM-XL201 Stamping Plate. 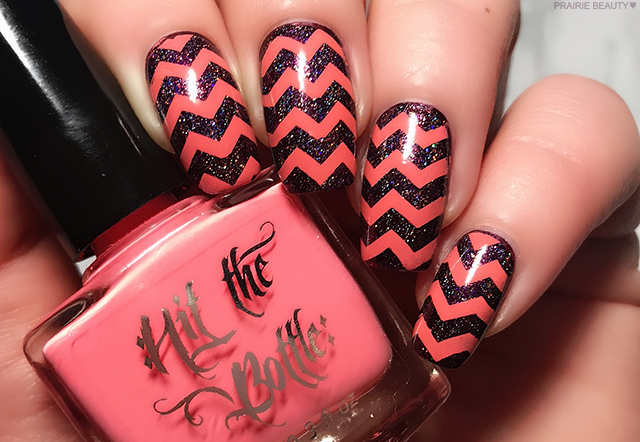 I almost entirely bought this plate because I wanted a chevron stamping image and this is a solidly good one. 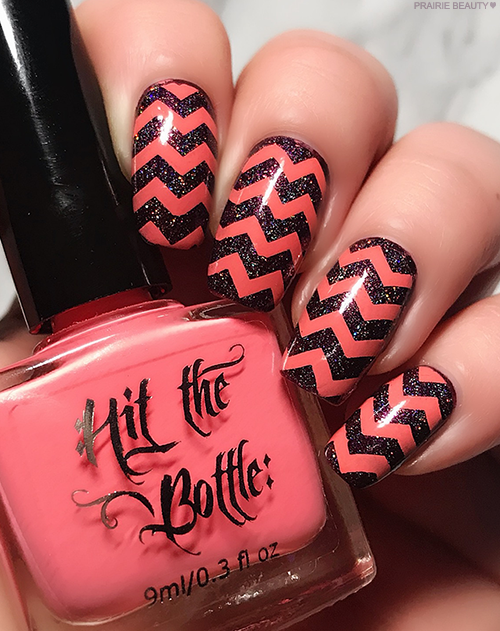 I used Hit The Bottle Peaches & Scream Stamping Polish and decided to do it across all of my nails. I added a decently thick coat of Seche Vive Top Coat to finish and voila! 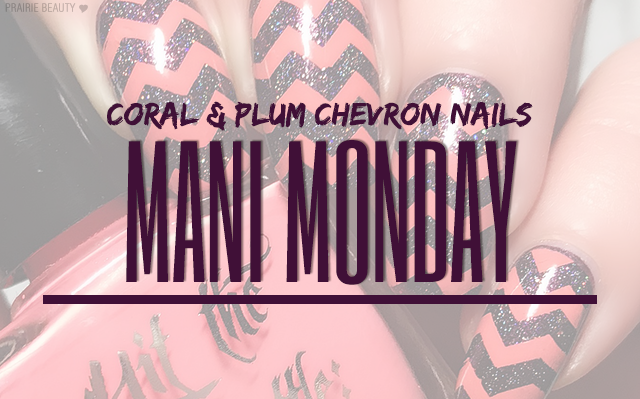 Don't forget to head over to Cosmetic Proof and See The World In Pink to see what the girls did with the Coral theme this week as well for #CBBxManiMonday!